It turns out I’m not the only one intrigued by playing multiple instruments at the same time. Below a small overview. I am always grateful to hear about videos or recordings I’m missing! Wofgang Saus shows the amazing possibilities of overtone singing. Generally associated with Tibethan monks, it’s a practice based on the very essence of sound. Inside every sound multiple other (especially) higher tones vibrate as well. In overtone singing the singer selects a particular frequency (note) to come out ‘of the sea’. There are many videos on how to learn this and several teachers as well, but this video shows very well how far you can take this practice. Rahsaan Roland Kirk plays 3 saxes at once (1:00) and later the recorder and flute (3:12) simultaneously. Both combinations are hard to imagine consider either space in the mouth or the extremely different types of air that the flute and recorder need. Fascinating! 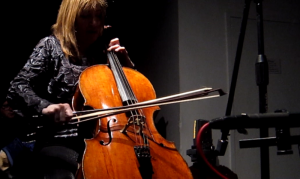 Cellist Frances-Marie Uitti developed a technique of playing the cello with two bows simultaneously. I found a wonderful CD of hers when in my “Listen to all the CD’s in the The Hague conservatory library” phase. I never managed to finish, but was very happy to meet this amazing CD and this fascinating result. Sound example of Uitti playing the cello with two bows. At 0:50 the real trick starts, but until then this showman, Baron Buika, gives us a marvellous overview of all the possible ways of holding the violin. The video is from 1959, live TV.